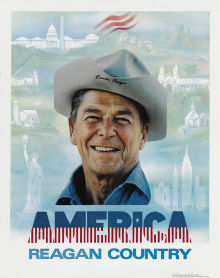 Today would have been the 100th birthday of Ronald Reagan. Of course it’s being marked by all sorts of celebrations of his life, his presidency and his legacy, nearly all of which profess great admiration for his vision and courage, even if they don’t agree with his policies. And among conservative American circles, the Gripper commands nearly as much veneration and respect as Jesus Christ himself. Just take a look at this GOP Presidential Debate at the Ronald Reagan Memorial Library in 2007. 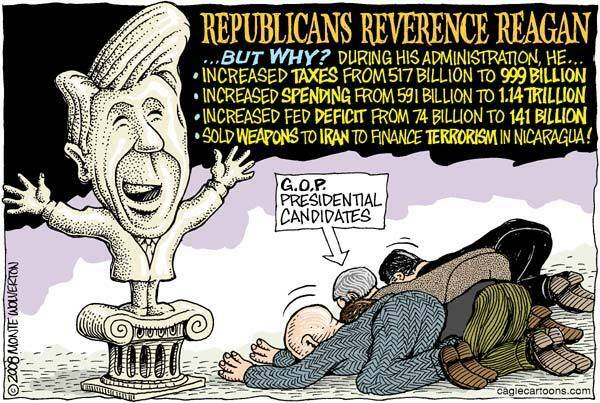 Obviously, they love Reagan for a reason. For one thing, he could speak beautifully, and was able to articulate his ideas in a way that everyone could understand and with a certain amount of dignity. Unlike our last Republican president, for example, he never got on stage and started floundering like a brain-damaged chimpanzee with attention deficit disorder. He positively oozed charm and like-ability, both of which are immensely helpful characteristics to have as the leader of the most powerful nation on Earth. But Reagan had something that is severely lacking among modern conservatives, and that’s his willingness to be a pragmatic leader rather than an ideologue. Right-wingers celebrate Reagan for being a “true conservative” – apparently as opposed to the phony Neocon conservatives who fill the GOP today – but what really made him a successful president was in fact his willingness to compromise when he needed to. In fact, if Reagan were to run on his record today, he would be considered so liberal that he’d be unelectable. He’d be crucified by the Tea Party, denounced as a RINO and would probably be defeated in a landslide in any GOP primary he entered. You thought conservatives dismissed McCain’s ’08 campaign for not being conservative enough? His stand on the issues made Reagan look like Barney Frank. Heck, half of the things Reagan supported as president are rejected by the modern Democratic Party. So, to sum up: Ronald Reagan’s conservatism: a heckuva lot better than the bulls**t that conservatives are calling for these days. So does that mean that Reagan was actually a great leader? It’s true that many liberals who once disdained everything he stood for have come to reconsider his legacy and even, in some cases even sing his praises. I think this is for a few reasons: 1) it’s much easier to give your enemies credit where credit is due when they no longer pose a direct threat; 2) compared to the deranged, power-hungry wingnuts who populate the Right today, Reagan really was a pretty decent leader; and 3) amnesia. The fact of the matter is that hindsight is just as often seen through the rose-colored glasses of nostalgia as it is 20/20. As the years pass, the outrages and atrocities of the Reagan Administration seem less terrible, since they happened so long ago, and happy things stand out ever more strongly. People think back fondly on his unwavering optimism, his love for all things American, his warm personality and his courageous stand against the menace of Communism. They forget about his pandering to racism, jingoism and xenophobia; his unwillingness to stand for human rights in non-Communist countries; his dismantling of the welfare system and his utter lack of concern for America’s poorest and most vulnerable citizens; his deregulation of the economy which increased the obscene gap between the wealthy and the poor, devastated the middle class and helped lead in part to the financial meltdown of two years ago; and above all his eager support for any fascist, thug or dictator who took an anti-Soviet stand. I never said that Reagan was the worst president in American history, or even the worst in recent memory (those dishonors would have to be given to James Buchanan and to either George W. Bush or perhaps Richard Nixon, respectively). What I am saying is that of all the presidents in American history, he is the one whose presidency has received the greatest amount of undeserved praise. You could do worse than to have a presidency as good as his – but you could also do a hell of a lot better. The very real role he played in the downfall of the Soviet Union – his ability to imagine that such an incredible dream could actually come true – is certainly his greatest accomplishment, and something for which he, along with his counterpart Gorbechev, deserve credit and admiration. Unfortunately, this doesn’t change the fact that as often as not, he brought out some of the worst in America, rather than the best. I don’t blame conservatives for admiring Ronald Reagan; it certainly beats holding up Nixon or W. as the model for the ideal conservative politician. 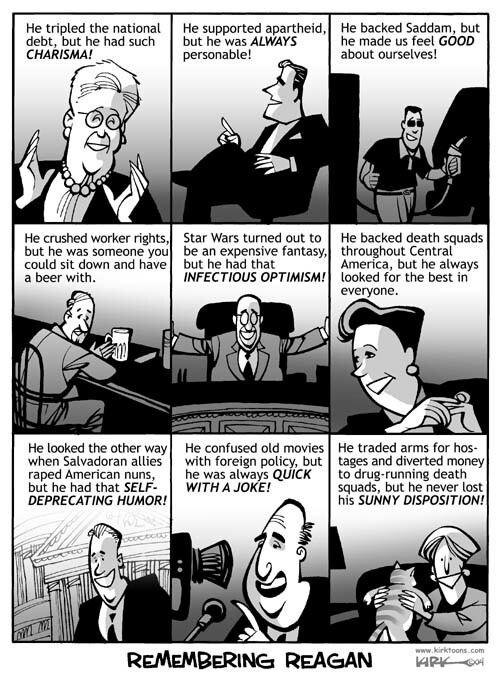 But at the same time it’s outrageous to pretend that Reagan could do no wrong. In fact, he did plenty of things that were not just wrong, but which were downright evil. And while he may have indeed been a “Great Communicator,” the reality is that much of what he said was inaccurate, deceitful or in some cases an outright lie. He was often ignorant, stupid, cynical, heartless and cruel in both his personal and political behavior, and he always had a smartass quip at hand to deflect any criticism which happened to make it his way. And the deplorable things he did in the name of strengthening and protecting the United States are enough to make any American with any sense of decency utterly ashamed to have had this man as their leader. If we’re really going to remember Ronald Reagan’s legacy today, let’s remember it in its sometimes ugly entirety, not just the parts his faithful worshipers want us to. Absolutely the most overrated president ever is Reagan. Although, on second thought, he probably is tied with Kennedy.